When it feels like wearing Birkenstock's- wear them! There are lots of ways how you can wear these shoes and stay looking great. I have found awesome images via Pinterest and I want you to take a closer look and see the best tips of wearing these great shoes nowadays. I like them for the urban look, which certainly has kind of French chicness touch and 1990's grunge look. They are not only comfortable, but also great for combining with your office basics, classic staples and smart-casual attire. You can either go all in white wearing these sandals with a classy suit, or fully glittery making a glamour sophisticated look. Just look in this black-white image where a girl appears in totally white look wearing a stylish cat ear black hat. There is kind of boyfriends touch in this look. We see an office appropriate outfit that features a mannish blazer, slim pants, spcious handbag and cool flats. The fully casual style cna be updated with a mannish, tuxedo look blazer in navy color. Finish the look by adding eye-catching jewelry. If you want yourself a playful style, then try on ripped jeans with casual black tee and moto jacket. These two looks are ideal for those women who want to wear something athletic inspired. I love the way track pants are teamed with chunky flats. Keep it fun with a washed denim overall worn with white tee and cool, chunky sandals. Speaking of other looks, then you can keep it sporty, by wearing skinnies, cropped tee with these shoes. 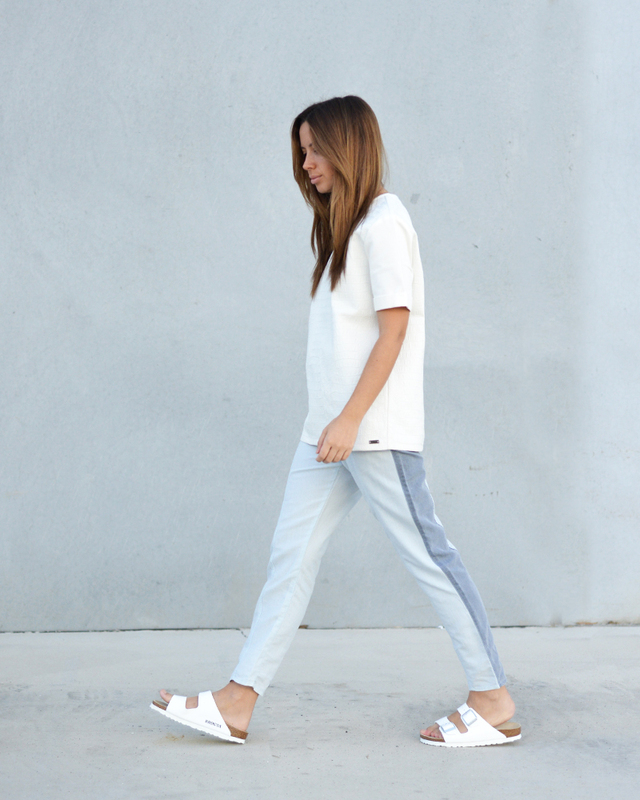 Or you can style slouchy denim trousers with a cool casual shirt and stylish Birkenstock flats. These shoes are ideal for making a real fashion statement. Nevertheless, many women are afraid of wearing this footwear in their everyday lives, because of the ugly appearance. All in all, I hope this compilation will inspire you to buy a nice pair of Birkenstock shoes. Update totally white look with black accessories like a cool, spacious handbag and cool sandals. If you feeling yourself like a hip hop star, then I suggest you to try on a black tank top, ankle length straight jeans and cool black cap with a patent visor. Do you like these shoes or hate them? Please comment, as I really want to find out what you think about them. These shoes were all the rage 60s-80s. Most get new tred replaced and are still wearing 45yr old Birkis! While the right slouchy socks look amazing for a casual comfortable winter look. Birkenstock have many styles, unisex and very feminine styles too. They’re the reason I can walk. Shhh. That’s my secret. To everyone else I’m incredibly on trend! Every closet should own a pair! But then I love the chunky shoe. Doc Martin’s are a fav too!